I wrote you yesterday from Littlestown Pa, & having a little time now thought I would write again today. Yesterday we kept our things on all day, expecting to be Ordered to move but of course was not sorry to stay. We have suffered everything this past week on account of Rations, talking about living on half Rations, we lived without any. I never knew what it was to suffer with hunger before, this morning I was so weak & faint I could hardly walk. We left our Camp at Littlestown this morning at 5 AM, & marched here, halting at 10 AM. We are to stay here tonight so the Guard has just told us. There is one thing I have forgotten to mention, Before we went into Battle, Col told us, that her wanted us to redeem our name, that we had been called Harpers Ferry Cowards, by the Old Troops & he wanted us to show them different. After we had broken 2 lines of Battle of the Rebs, who were advancing on us, Hays, rode on front of us & yelled out, Harpers Ferry Cowards ah. The Old Troops say they never saw a Regt fight better than we did, We have got a good name among them. As yet our Corps, has had no Credit at all in the Papers, though we were in the centre & was under fire more than any other. The lists of killed & wouded, will tell, who did the work, if nothing more. I will send you a list of Killed Wounded & missing in our Co, in this, which you can publish if you choose. 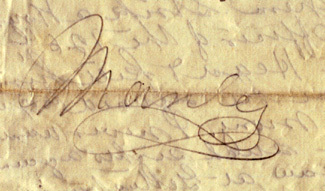 1Granger, Erastus M.–age,?? Enrolled 7 Aug 1862 at Auburn to serve three years. Mustered in as second lieutenant, Co. D, 20 Aug 1862. Killed in action, 3 Jul 1863, at Gettysburg, PA.
2Flier, Abram–age,40 Enlisted 21 Jul 1862 at Sodus to serve three years. Killed in action, 3 Jul 1863, at Gettysburg, PA.; also borne as Fliar. 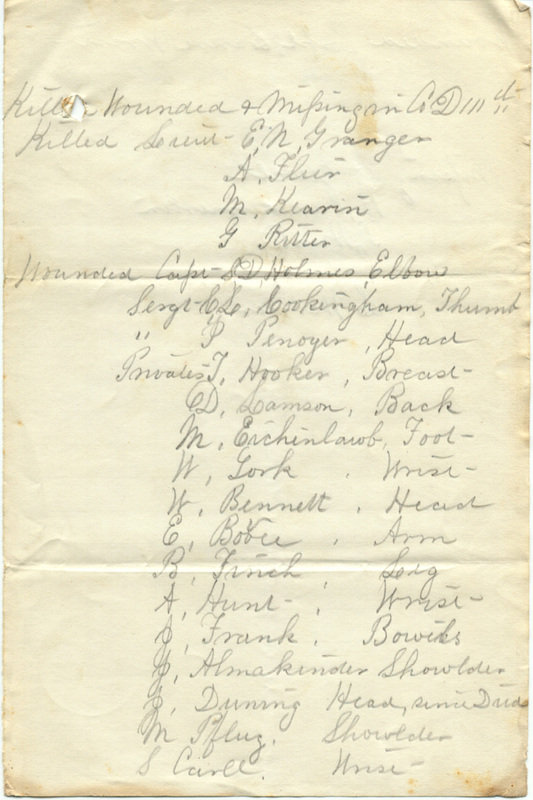 3Kearin, Michael–age,18 Enlisted 6 Aug 1862 at Lyons to serve three years. Killed in action, 2 Jul 1863, at Gettysburg, PA.
5Holmes, Sebastian D.–age,?? Enrolled 7 Aug 1862 at Auburn to serve three years. Mustered in as captain, Co. D, 15 Aug 1862; wounded in action, 3 Jul 1863, at Gettysburg, PA.; discharged for disability, 27 Jun 1864. 6Cookingham, Charles L.–age,18. Enlisted 6 Aug 1862 at Galen. Wounded in action 3 Jul 1863, at Gettysburg, PA.; killed in action 5 May 1864, at The Wilderness, VA.
8Hooker, Thomas–age,19 Enlisted 6 Aug 1862 at Lyons to serve three years. Wounded in action, 3 Jul 1863, at Gettysburg, PA.; captured in action, 22 Jun 1864, at Petersburg, VA.; died, no date, while a prisoner of war. 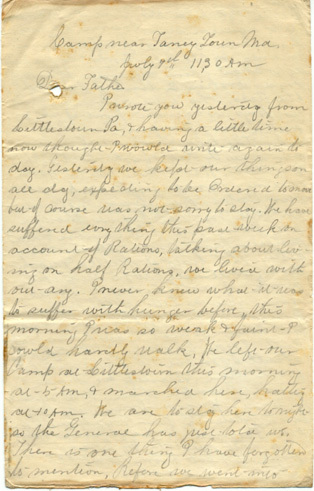 9Lamson, Daniel W.–age,23 Enlisted 7 Aug 1862 at Lyons to serve three years. Wounded in action, 2 Jul 1863, at Gettysburg, PA.; captured 5 Jun 1864,at Cold Harbor, VA.; no further record; also borne as Lampson. 11York, William–age,25 Enlisted 6 Aug 1862 at Sodus to serve three years; mustered in as corporal, Co. D, 20 Aug 1862; returned to the ranks, no date; wounded in action, 3 Jul 1863, at Gettysburg, PA.; captured in action, 21 Jun 1864, before Petersburg, PA.; no further record. 12Bennett, Wesley–age,20. Enlisted 28 Jul 1862 at Lyons.Wounded in action 2 Jul 1863 at Gettysburg, PA.
13Bovee, Edward–age,18. Enlisted 17 Jul 1862 at Lyons. Wounded in action 2 Jul 1863 at Gettysburg, PA.
14Finch, Benjamin–age,31 Enlisted 28 Jul 1862 at Lyons to serve three years. Wounded in action, 3 Jul 1863, at Gettysburg, PA.; discharged, 17 Apr 1864, at Newark, NJ. 15Hunt, Albert A.–age,18 Enlisted 9 Aug 1862 at Lyons to serve three years. Wounded in action, 3 Jul 1863, at Gettysburg, PA.; discharged, no date. 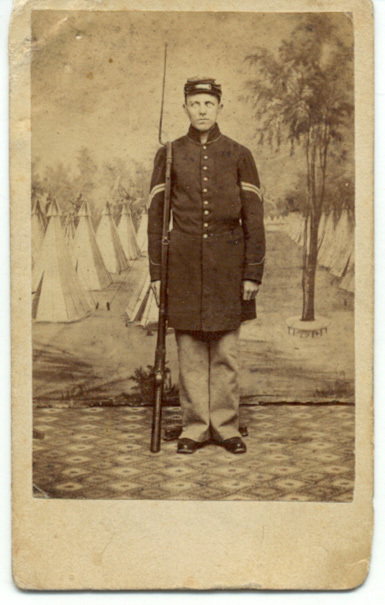 16Frank, John A.–age,22 Enlisted 20 Jul 1862 at Sodus to serve three years. Wounded in action, 3 Jul 1863, at Gettysburg, PA.; transferred to Veteran Reserve Corps, no date, from which mustered out, 28 Jun 1865, as of Co. G, Tenth Regiment, at Washington, DC. 17Almarkinders, John.–age,35. Enlisted 7 Aug 1862 at Sodus. Wounded in action 2 Jul 1863 at Gettysburgh, PA.
18Dunning, John–age,18. Enlisted 29 Jul 1862 at Williamson to serve three years. Wounded in action, 2 or 3 Jul 1863, at Gettysburg, PA.; died of his wounds 7 Jul 1863. 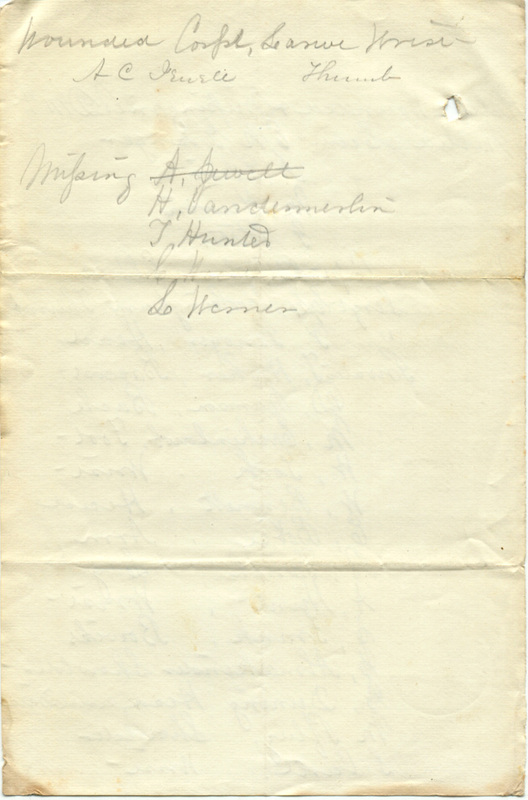 19Pflug, Martin–age,19 Enlisted 6 Aug 1862 at Lyons to serve three years. Wounded in action, 2 Jul 1863, at Gettysburg, PA.; discharged for disability, 11 Dec 1863. 20Carll, Simeon–age,23. Enlisted 5 Aug 1862 at Lyons. Wounded 2 Jul 1863 at Gettysburg, PA.; Killed in action 5 May 1864 at The Wilderness, VA.; also borne as Carroll. 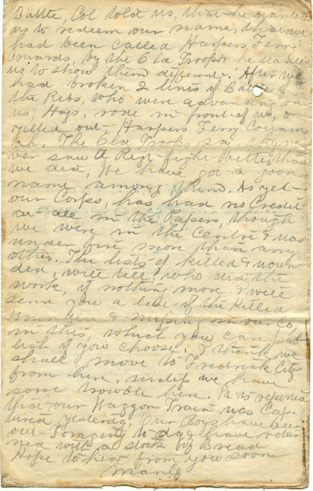 21Larue, James H.–age,24 Enlisted 6 Aug 1862 at Lyons to serve three years. Promoted corporal, no date; wounded in action, 3 Jul 1863, at Gettysburg, PA.; discharged for disability, 29 Jan 1864. 23?Hunter, Thomas–age,45 Enlisted 20 Jul 1862 at Lyons to serve three years. Captured in action, 22 Jun 1864, at Petersburg, VA.; paroled, no date; mustered out with company, 4 Jun 1865, neat Alexandria, VA.
24Warner, Ludewic–age,34 Enlisted 29 Jul 1862 at Lyons to serve three years; mustered in as private, Co. D, 20 Aug 1863; deserted, 2 Jul 1863, at Gettysburg, PA.; also borne as Louis Warnor and Werner. 25?Weden, Charles–age,30 Enlisted 6 Aug 1862 at Lyons to serve three years; mustered in as private, Co. D, 20 Aug 1862; killed in action, 2 Jul 1863, at Gettysburg, PA.; also borne as Wedin and Weeden.